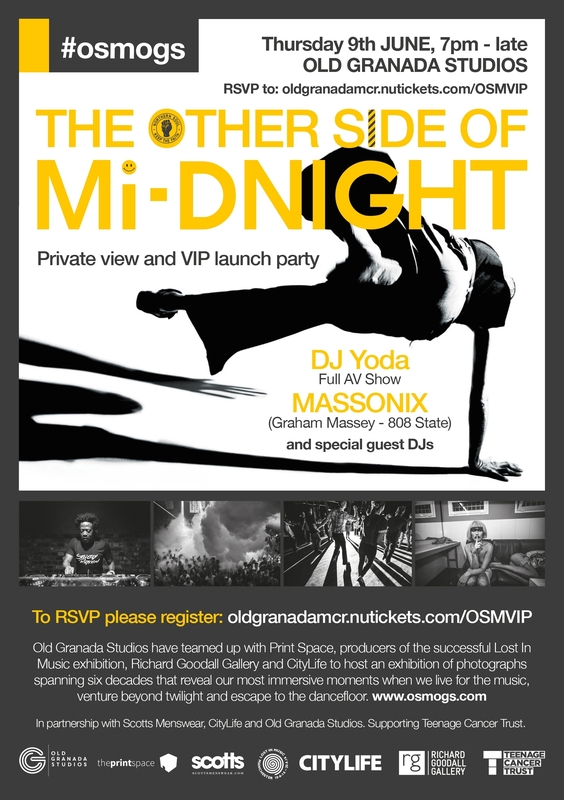 Old Granada Studios would like to invite you to the VIP launch of The Other Side of Midnight - featuring DJ Yoda, Massonix (Graham Massey, 808 State) and special guest DJs. Old Granada Studios has teamed up with Print Space, producers of the successful Lost In Music exhibition, to host an exclusive exhibition of photographs spanning six decades. The Other Side of Midnight will reveal our most immersive moments when we live for the music – from the great outdoors to the dancefloor. Curated by internationally renowned ex- Haçienda resident DJ Paulette and iconic lensman and music entrepreneur Gary McLarnan of Sparklestreet, The Other Side of Midnight will add a regional twist to the successful Lost In Music exhibition , capturing the artists, the sights and the sounds that all passed through the doors of Old Granada’s iconic Quay Street studios. The exhibition will run for ten days in tandem with the Parklife and Stone Roses events taking place in Manchester. The event is a partnership between Print Space, Scotts Menswear, City Life, Richard Goodall Gallery and Old Granada Studios. The Other Side of Midnight depicts the region’s keen eye on club culture, social and club trends and their evolution through the many different genres and decades. Reggae soundsystems, punk and goth kids, break dancers, jazz dancers, ravers on podiums and crowds losing themselves in the music all fall under their expert gaze and ingenious apertures. With a nod and flourish to the 34 years since the Hacienda first opened its doors, and a deep bow to Anthony H Wilson and all things Granada Studios, the team behind this exhibition has mined the archives of prestigious photographers to unearth some true gems. Featured photographers include local photographers and the general public alike. Industry renowned photographers include; Kevin Cummins, Mark McNulty, Peter J Walsh, Ian Tilton, Grant Fleming, Dave Swindells, David Lake, Lee Baxter, Al Baker, Elaine Constantine, Jocelyn Bain Hogg, Tilman Brembs, Brian Cannon, Dean Chalkley, Suzy Del Campo, Alex Gerry, Martyn Goodacre, Stuart Griffiths, Gavin Mills, Daniel Newman, Normski, Matthew Smith, David Titlow, Dougie Wallace, Marco Grey and George Quann-Barnett.